The Afar Region in Eastern Africa is renowned for stunning evidence of plate tectonics and for a famous fossil named after a song by The Beatles. The Afar Triangle, in Eastern Africa, is a nearly barren rockscape at the junction of three pieces of the Earth's crust. Centered about the Afar Depression, at 509 feet / 155 meters below sea level, this junction of tectonic ridges, known as the East African Rift, is splitting apart and pulling away. The junction consists of the Arabian Plate to the North and East, and the African Plate to the West and South. The African Plate is subdividing into two new tectonic plates, or protoplates, known as the Nubian Plate and the Somali Plate. Geologists believe the pulling apart of these plates will eventually form a new ocean basin. The junction is shown in this image above (from NASA’s Terra satellite). The pulling apart stresses the rock which causes cracks, faults, volcanoes, fumaroles (gas vents), escarpments, and hot springs. 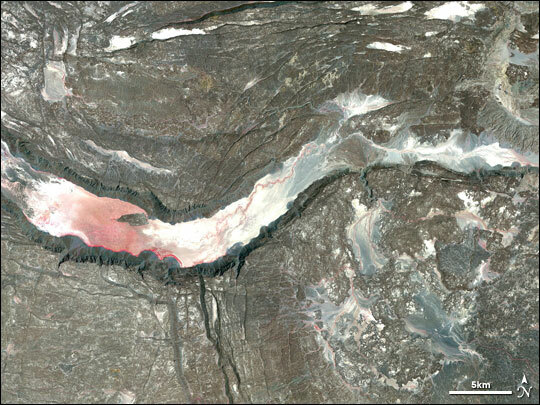 The river-like feature that transects the image is a graben. This graben is a depression caused by the sinking of the ground when earth on either side pulls apart. The fossil of a young adult female was discovered in the Afar region by a team of paleoanthropologists in 1974. The team called her "Lucy" because The Beatles song Lucy in the Sky with Diamonds played on the radio as they examined the find. Lucy's scientific name later became Australopithecus Afarensis. Australopithecus Afarensis is an extinct hominid that lived between 3.9 and 2.9 million years ago. Lucy was a bipedal hominid about a meter tall with a small brain and a primitive face. Radiometric dating of the surrounding rocks suggest Lucy's age is about 3.2 million years.